Igor Stravinsky’s music was truly revolutionary in every sense of the word. Not surprisingly, it was banned by the Soviets for two decades. Though his monumental Rite of Spring scandalized 1913 France as well, he reached a few receptive ears, including those of fashion icon Coco Chanel, who becomes his patron and lover in Jan Kounen’s Coco Chanel & Igor Stravinsky (trailer here), opening this Friday in New York. It was a glorious disaster. Though mild by ’68 standards, a legitimate riot broke out during the premiere of Rite. Living in exile, Stravinsky’s situation was precarious, yet he remained defiant in the face of public scorn. By this time, Chanel was well established as an independent woman of means. Responding to something in Stravinsky’s music, she houses the composer, his consumptive wife Catherine, and their two sons in her country villa. Stravinsky is now free to work without the pressure of financial concerns. However, the growing attraction between the composer and the designer (particularly pronounced on his part) puts new stress on the Stravinsky family. While Kounen occasionally lets the proceedings temporarily slide into melodrama, he nails the big scenes. His opening sequences brilliantly recreate the infamous debut of Rite. Witnessing such fervent responses to music, both positive and mostly negative, is surprisingly good cinema. It underscores the idea that art and music matter. Such issues are important to the film, as when a spurned Stravinsky belittles the legitimacy of Chanel’s creative endeavors. However, Kounen more than gives the fashion legend her proper due, most effectively dramatizing the development of her first signature fragrance. 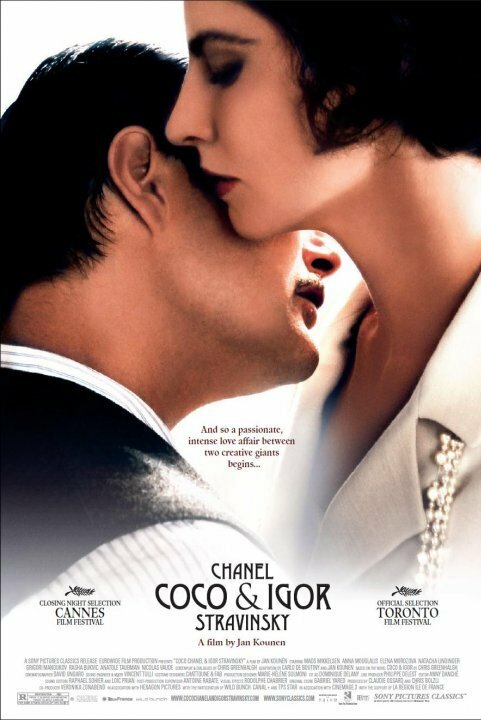 CC&IS is the second big screen treatment of Coco Chanel’s life from Sony Classics in less than a year, but it is clearly the greater of the two. 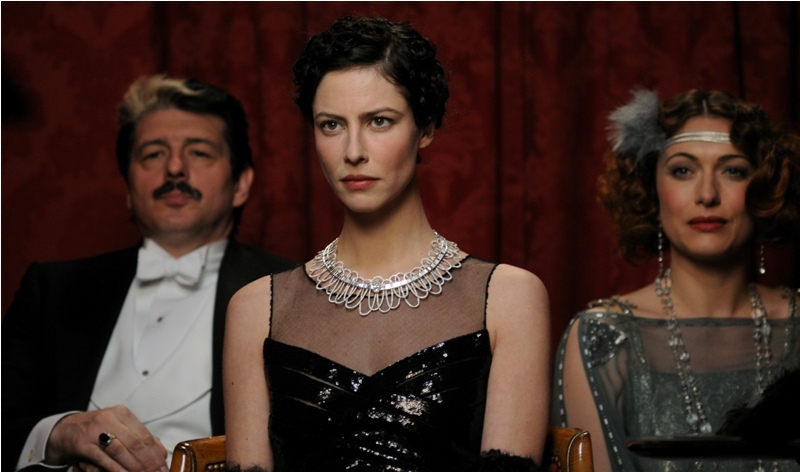 While it might sound superficial, Anna Mouglalis simply looks better in the role, with her height and natural elegance better suited to Chanel’s style than the more diminutive Audrey Tatou in Anne Fontaine’s Coco Before Chanel. She is also more successful expressing the burning drive beneath Chanel’s severe exterior. In addition, admirers of Chanel will most likely better appreciate the period in her life chronicled in Kounen’s film than that of its predecessor. While during most of Before, Chanel is a kept woman, in CC&IS, she is essentially the one doing the keeping. As the recipient of Chanel’s hospitality, Danish actor Mads Mikkelsen is a bit of a cold fish, but he has some nice moments conveying the passion of the creative process. Indeed, Stravinsky’s music is shrewdly integrated into the film, while Oscar winning composer Gabriel Yared deserves credit just for acceptin g the intimidating assignment of scoring a film about Stravinsky. The superior Chanel biopic and one of the better films about classical music in general, CC&IS is a handsome looking prestige production. Well worth seeing for its elegant style and Mouglalis’s pitch perfect performance, Kounen’s Chanel film opens this Friday (6/11) in New York at the Paris Theatre and the Angelika Film Center.